Notes: On the game menu, the leftmost button will run the benchmark in High. The next button will run the benchmark in Low. The rightmost button will quit. My test was run using a Geforce 8600GT. Also known as "Dynasty Warriors 6"
Another benchmark from the Shin Sangokumusou series. The benchmark is gameplay, with a character running around fighting his way through waves of enemies. This repeats three times, each time with a different character, before the test ends with a framerate score. 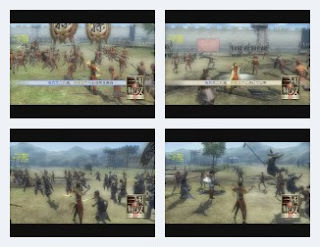 Music and sound effects accompany the action, but the graphics are a little to be desired, especially compared to other Shin Sangokumusou benchmarks (see Shin Sangokumusou Online). Not recommended.